Most frequently, one implant per missing tooth is placed. 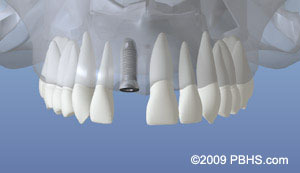 However, if many adjacent teeth are missing, it is common to space implants apart and restore multiple missing teeth with bridgework supportive by the implants. 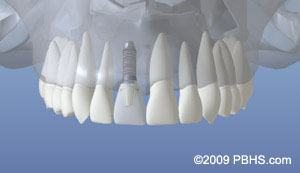 In most all cases, a minimum of four implants is needed to replace all of the lower teeth, and six implants to replace all of the upper teeth.